Fiber Flux: Knook Review and Giveaway! I recently got to play around with the Knook, a interesting tool that allows you to knit with a crochet hook...being both a crocheter and knitter I was curious for sure. The set comes with 10 Knook tools (yes 10! ), plus the satin cords needed to use the tool. You can use the set for finer yarn, all the way up to very bulky yarn. Everything is color coded to make it easy to use and get started too. A special thanks to Leisure Arts for sponsoring this giveaway! Can't wait? Need more? Click below to purchase and get 20% off...makes a unique gift too! Giveaway has ended! Congratulations to the winner and thanks to all of you who entered! For more fun projects and pretty patterns, be sure to follow Fiber Flux on Google+, Facebook, Twitter, and Pinterest for the latest updates! I would start with a scarf or dishcloth to get the technique down and then advance to a hat for our three year old son! I love the knook set. I only have the small set of 3 but has made knitting so much easier for me. I can't knit otherwise but love to crochet. Would be awesome to win this set. Also I love all the stuff you post. You always have such beautiful and unique patterns. Thank you! Sooo nice. I need these hooks. I would make a scarf, thanks! 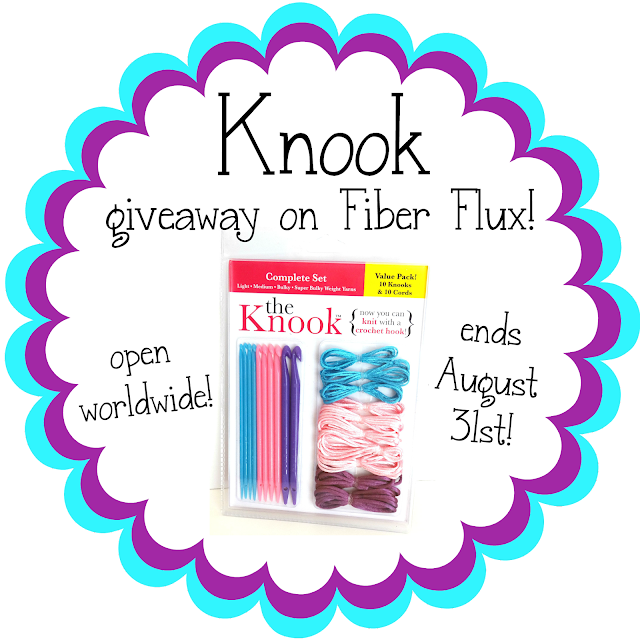 I have always wanted to try this Knook thing! It looks intriguing and I would make a scarf for my daughter for her birthday! how exciting! i haven't had much success with knitting, maybe this is what i need!!! The video is awesome. You have clearly explained the Knook and how to use it. Thank you. And thank you for a chance to win this Knook too. I'd make a scarf ! I would make a scarf to begin with since I have never used a knook before. Would kook a fun scarf. I would make items for the Children's Hospital and hospice and then for the Christmas hat and mitten tree. Always interested in learning a new craft! I really enjoy your newsletter. There is always something interesting to read! Looks interesting! I'd make a scarf to start off. I'd try making a scarf to learn this new technique. I think I'd start with something basic like a washcloth or scarf! Sounds like a fun new technique to learn. A new scarf always makes my coat feel new again. I do not know what I would make, I've never knooked before lol. Never used it before so I would try my hand at wash cloths for gifts first then go from there! Thanks for the chance to win such a fun giveaway! Love to have one ! Would love to try such an intriguing product.. This is an awesome giveaway and I would love to try it! The Knook looks like fun and I'd love to give it a try. Would love to give it a try. I'd probably try it first to make a scarf. I love knit, but I crochet. Would like to try this tool! I would try and make a hat with the knook. I would love to make a cute, Fall scarf. I have one but have not made anything successfully. I love to make bags. I would love to try my hand with the knook so certain crochet looks like knitting. Fingers Crossed! Thanks for sharing a great product and giveaway! I think I would start with a scarf and then see where I could go from there. Thanks for the giveaway! I would make a scarf first just for practice. I've been thinking about giving knook a try. I'd start with a scarf. I would make a scarf probably because it would be the easiest. I'm not sure what I'd make yet!